first off: i can't believe i'm actually writing a post about the bachelor. but i really just have to. last nights episode was too great. can i just say how amazing this show is? i've watched other seasons, but i never actually get that into it (except last season & that was obviously due to jef holm being from provo). & like past seasons, i haven't actually cared if i missed any episodes this season. HOWEVER, i am so happy i did not miss last nights. constantly coming up with the best one-liners. example: "men just love me." seriously, how does abc find these amazing girls to cast on the show!? i don't know how they are so great at picking the crazies, but they really know what they're doing. all these girls really make this show PURE GOLD. i'm so happy she sparkled her way right off the show!!!!!!! Hahahaha SO funny!! "I can't control what my eye brows do!" tierra is crazy town and the only reason my husband watches shows like these is because of the crazy women! 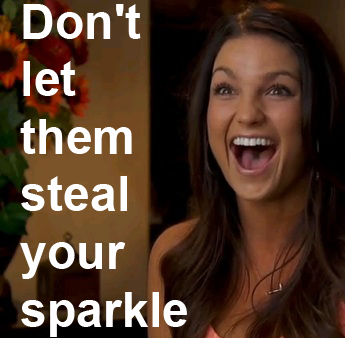 hahah they are the best part about the bachelor, but even considering tierra, i think courtney was the most evil!